Brittany Diamond has been an athlete since childhood. But the predominant theme you’ll find if you visit her social media account is far less common: the 5-foot-7-inch, 160-pound Diamond is a strongwoman, fiercely dedicated to lifting and carrying as much weight as possible. Diamond recently placed seventh out of 17 in her weight class at the 2015 Arnold Amateur Strongman World Championship in Columbus, Ohio. She competed in events whose very names sound bone-crunching: the dumbbell clean and press, Farmer’s Walk, yoke walk, and three different dead lifts. Diamond set personal records in all but one event. The Farmer’s Walk meant running as fast as she could with “two implements by her side, almost like big metal suitcases,” said Eric Dawson, owner of Titan Barbell in Medford, where she trains. The yoke is a bar that goes across her back and carries two pillars, each of which holds weights. Diamond had to carry 450 pounds for 60 feet. While she did not make it to the finals — only the top four qualified — she is determined to do so next year. Diamond, a Gloucester native who now lives in Medford, has been an athlete since childhood. She ran track in high school and rowed at the University of Rhode Island, where she studied communications and business. She stumbled on the website Starting Strongman her junior year of college and from there found New England Women of Strength (NEWS), a strongwoman community founded by Diamond’s now-friend Gina Melnik. NEWS was having a local competition in August 2013, and Diamond signed up for the novice division. Melnik recalls being both “blown away” and somewhat nervous about how Diamond dove into the strongwoman world headfirst. From there, Diamond fell in love with the sport. 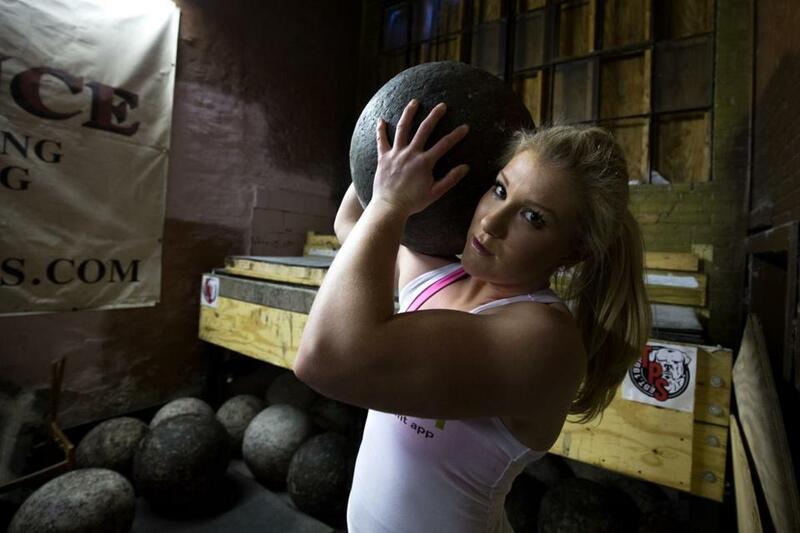 She prepped for 12 weeks leading up to the Mass State Strongman contest, held last Aug. 9 at Total Performance Sports , an Everett gym where she also trains. Two days later, she started her first post-college job. Diamond is on the marketing team at looped in , a mobile payment app geared toward college students. In August, the company got a new chief executive, John Feloni, and Diamond thought he looked familiar. It turns out he also works out at the Everett gym and had seen her compete before. It was the people at looped in, Diamond said, who persuaded her to go to nationals, and the company even sponsored her trip to Ohio. She is known for being positive and enthusiastic both at work and in her training.